Of course, most characteristics that are successfully present in church planters are equally valuable in the life of the Replanter. An apostolic gifting for proclamation and founding a new work, an entrepreneurial spirit, and a natural ability to gather people will all serve the Replant Pastor well. However, there are some unique qualities that I have identified as extremely helpful in the replant context. They are not deal-breakers if an individual is not naturally strong in each area, but it will make their job much harder if they do not go into the mission with these three attributes in their tool belt. 1) A love for the local church. The Replanter must love the very idea of the local church. They don't have to love the baggage or other problems they may have seen, but they should appreciate God's great plan to use the church as his chosen vehicle to carry the Gospel. This must include a heart for seeing a redemptive narrative in each one of these congregations. In the past, a true planter would often look at an existing church and see nothing of value. They would rightfully note that it is easier to start over. In some ways it is, but not in others. In a replant you have instant people, infrastructure, legal status, and so much more that comes with building on a past legacy. Of course, you also have the negative reverse of those same elements. The Replanter must look for the divine spark in each of these elements – what blessing has God given their mission in these things that might be seen as a detriment to other planters? Replanters need to weep at the reality of churches closing all around them every week. Without this burden, they will be tempted to walk away when things get hard. Not to say that a regular planter does not have this, but this means more in the replant context. More than a trendy gathering or transitioning an “old” church to a cerebral coffee culture, the replant core group will need to know that their new leader cares about them as individuals. Replanters must ask themselves: what are we asking them [the members] to give up? Power, position, certain songs, silk flowers? You can cast a vision that will explain why this can all be changed for the right purpose. You cannot cast an effective vision for becoming their pastor only to ignore their needs and concerns. They have belonged to a church family for many reasons – but one in particular is because they need support in times of need. As many core groups age, Replanters cannot abandon them in this critical time. The Replanter who imagines themselves an entrepreneur first will launch big, gather a crowd, but not retain members because people will feel that they care about corporate success over individual lives. 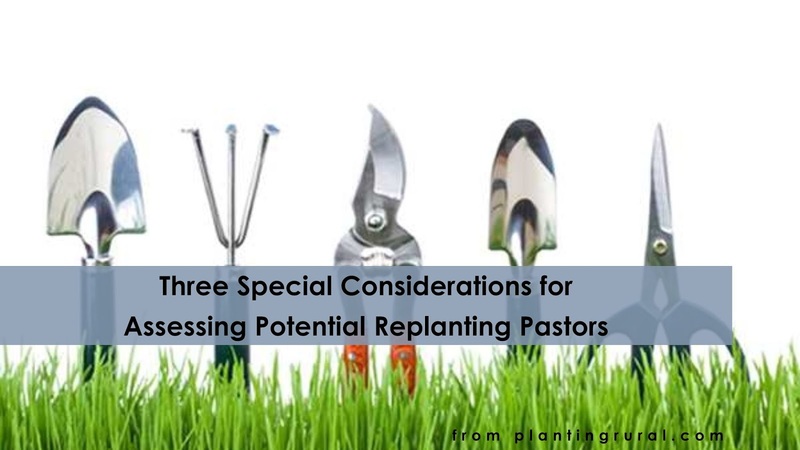 Remember – Replanters are still pastors. An amped up ability to cast a vision is vitally important for a Replanter. It is much easier to skimp by on casting a mediocre vision for a group that has never failed together. The Replanter must be able to cast vision to a community of believers where not only have they heard “good ideas” before, they have been an active part of a dead or dying vision and are thus justifiably skeptical of anything that sounds like a new way to package the same old ideas. Replanters have to clearly believe that God is going to do great things and share a strong way forward for the specific context that they are called to reach. If an assessment team cannot get a good description of the vision God has placed in a potential Replanter’s heart within a conversation or two, chances are their new church members won’t either. Beware of commissioning the “next pastor” instead of a true Replanter, because, call it what you want, the surviving core group will decide which title is true.